I get asked quite frequently, “How do you manage everything?” As I have mentioned before, balance is a mythical word to me. If I am ahead on work it usually means my house is a mess and dinner is not made. If my house is perfectly together, it usually means I am behind on work. Working from home is always a give and take, a push and a pull, and usually there is no such thing as balance. HOWEVER, it might help some of you to shed some light on how I have found a way to make it work for our family. It is different for everyone, but for now in this phase of our life, this is what works. 7:00 AM – The boys leave for school/work. Veronica wakes up and we have breakfast together. 7:15 AM- Pull out the Melissa & Doug toys, puzzles, and books for Veronica. She loves to read and cuddle on the couch so this is usually when I catch up and answer emails. 8:00 – Max wakes up and Veronica dotes on him for a long while and I let them have time together. 8:45 – Go over blog post written the night before, publish, and post to social media. 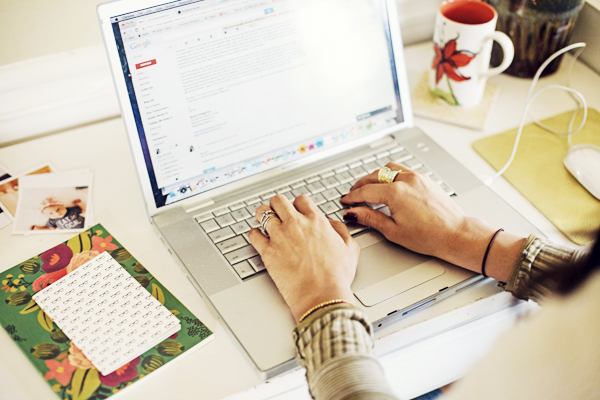 Schedule social media posts, answer more emails. Veronica watches one of her favorite shows during this time. Max is chilling next to me. Sometimes he will fall asleep for a nap. 9:30 – I use the chunk of the morning to either run errands (Store, post office, etc. ), OR playdates with other friends. Veronica does so much better behavior wise if I give her that uninterrupted time. 11:00 – Picking up around the house, clean, and address any other messy situation. Change diapers, etc. V attempts to help and creates bigger messes. Max will chill or nap in his Mamaroo. 11:45 – Leave to pick up Gabriel from school. 12:15 – Feed the kids lunch, talk about Gabriel’s day, take them outside, or encourage them to play inside. I am usually feeding Max again as well. 1:00 pm – Put all three kids down for a nap (this is the miracle of the current situation). During this time is my main chunk of work time. I am at my desk planning out ideas, sending emails, photo editing, writing, photo shooting, etc. This is when the majority of my productivity happens and I am most creative. I used to be a morning person but since I would rather be focused on the kids when they are awake, this is second best. 4 pm – Kids wake up, and eat snack, construct buildings, build forts, draw endless amounts of faces… That sort of thing. I pick up around the house because if you have little ones you know how by mid-day it can look like someone shook it upside down. More diaper changes. 5:30 – Gabe comes home and its everyone’s favorite moment. We all compete for his attention as he tries to catch his breath from a long day at work. He usually takes a minute to unwind. I shoot him some food. He then takes over parenting duty. (Its a team sport over here;)) He usually takes them for a walk or to the park while I finish dinner and get it on the table. 6:00 – We all sit down and eat and it is never short of an entertaining experience. 6:45- Gabe and I tag team the kitchen and the kids. 8:00 – Bedtime routine tackled by both Gabe and I. (Feed Max again during this time.) Books, prayers, and hugs. 8:30 – I go to work again. I prepare the post for the next day, prepare any projects due, and do another round of social media. I have been using this time to develop content for The Brand Market as well. 9:30 – I try to cut off by this point so Gabe and I can have some time together to unwind. So important and we both look forward to it. Its necessary and valued! This is the rough breakdown of our day with variations of course. Our schedule changes almost every few months based on the phases my children are in. Even right now, I am posting in the afternoon due to a difficult morning with my feisty 2 yr. old;) If there is a heavy work load, I call for re-inforcements! I have no problem hiring a babysitter when I need a catch up morning. This happens about every other week, and I have a wonderful gal who comes to stay with Veronica and Max if I have a photoshoot or a meeting. Looking forward, due to the new business and managing IHOD, I will most likely hire help to manage emails since this is the thing that takes the majority of my time to keep up with. I often reach burn out and have days where Veronica watches too much tv or we eat out one too many times in a week, but I have learned not to feel guilty and just remind myself that supermom is not a person I am willing to chase. The only mother I compare myself to is my own mother, because I would love to be half the woman she is. At the end of the day, I just want my husband and children to be most loved and tended to…over my emails and laundry. I fail at this over and over but it will always be my main goal and motivation. If they can associate home with happiness and love, than I have succeeded in balancing many hats. I am not looking to be the most successful blogger, designer, entrepreneur, etc. I measure success by the tone of our household, and how we are all treating each other. If I am on edge, the kids pick up on it and respond the same. If I am offering a warm voice and warm meals, everyone is happy. So if this means giving up some big opportunities so as not to stretch myself too thin or take too much time away, I am okay with that. At the end of my life, I am not going to be asked if I was on Martha Stewart or not (wink wink), but I know I will be accountable for the well being of my family and how much love I put into my role as a mother and a wife. So there you have it! How do you try to manage your day? Tips? I will always take them! Amen! Loved the post– just what I needed to hear right now as maternity leave is ending and I head back to working from home. thanks for sharing Anna! I’m in the midst of my naptime workmode at the moment as well 😉 (which was in rare form today; half the days this is not as successful). I really appreciate your comments at the bottom: “I measure success by the tone of our household, and how we are all treating eachother” YES. Mama sets the tone and mood for everyone, and it’s tough to stay happy. but remembering to take each moment and every feeding and mess as a blessing is so helpful! *hugs* love you! Love this. I like seeing other peoples schedules and how they work with kids. I’d love to work with you & answer emails. wow Anna, thats what I call a busy day!! keep it up you do such a great job!! Love seeing a peak of your home too! I love peeking into the day of someone I admire! I must say, I’ve often wondered how you do it. I don’t even have kids yet and I’m struggling to keep up with my blog, though I do have a regular ol’ 9-5 job. But still. I can’t even manage to get up a little earlier or stay up a little later these days! You are pretty phenomenal! I love peaking into other people’s days. Especially when there some intel on how they manage to ‘do-it-all’. I love that you make time for your husband. We really need to do that. Enjoyed this post! No kids here yet but I was a full time nanny for 3 years so I somewhat understand managing kids all day, I say somewhat because I never want to sound like I understand motherhood just because I was a nanny :). I do need to get more of a schedule in my day to day blogging. Thanks for sharing! Beautiful perspective on work & family, I admire all you do! This was a great post! I always wonder how busy bloggers like yourself balance all those spinning plates, and so elegantly (at least from the outside, haha) at that. Cheers to you for putting family first! In my eyes, you ARE supermom. I don’t know how you do it! Our days seem similar in the act of juggling but you add one more kiddo to the mix- bravo you are an awesome lady! Also, I know I’m a little late but so awesome that you were on mathastewart.com!!!! As a mother I can relate to the constant, always changing, juggle of a day with kids (but I don’t have a business to run). You have your hands full (in the best way) and I love how you said “At the end of the day, I just want my husband and children to be most loved and tended to…over my emails and laundry.” Such a great mama you are. Thanks for sharing this! Great post! You sure make it look easy…but I know it hardly ever is. 😉 Thanks for sharing! This is so fun to read! Isn’t being a work-at-home mom an adventure? So insightful and well said. I need to remember this! Really loved reading this, Anna! I admire your ability to manage it all so well and to know that something’s gotta give. Great post! I can totally relate with your typical day, mine looks a lot like that except both my kids go to school so I do have a few kid-free hours. I admire all that you accomplish during nap time, that’s pretty amazing! Aw, such a great post! You juggle your work/life balance so well! I completely know how difficult that is, but how much greater it must be while having a family! It’s always something to work on, but I love how you’re making it an effort to balance everything the best way that you can and making sure your family gets your full attention during those designated times – and of course, you totally deserve those “off” days!!! your workspace! so fabulous. love this post as well. I really enjoyed reading a out your day. I’m a stay at home mom of two boys. Both are in school. I do miss the times that there were home with me. But after school is when it gets chaotic. Mix in homework, karate, soccer practice, swim lessons, therapy sessions. It’s tough but we manage. Great post sister! I enjoyed reading it and always enjoy your perspective on life’s challenges. And Martha has nothing on you gal!!! I would seriously love to work for you. I’m an inbox-zero genius. Now I’m kicking myself… I had an email waiting for you in my drafts about how impressed I am with everything you do for your family, your blog, and for the blogging community. Okay… proofing it and sending it mañana! Thank you so much for sharing this! So timely for me as I am getting ready to launch a new blog/website and I had a super stressful, testy afternoon. I am a new mom, an almost 6 month old, and she is INCREDIBLY happy and easy, but the guilt is where I am struggling…I agree, if I am caught up on work, dinner is rushed and I feel I am doing a bad job as a wife. I always try to put 100% attention into baby, no screens at all during day, but today I was really behind on e-mails and such. Hubby is my hero and helps out immensely as soon as he gets home. Still trying to figure out a rhythm so I admire you so much who has THREE kiddos and a thriving business! Such a role model. Oh, and one reason I am launching a new site is to incorporate more and challenge myself more in that very arena of life balance…and time for prayer- very good point! Thanks truly! You’re my hero, Anna! And I absolutely LOVE your office space! Oh dear, you definitely have a lot in your plate! thank you for sharing, the days i say i don’t have enough time, i’ll just check back on your schedule! You’re a supermom in my book! Your kids are all sweet, smart, well adjusted kids. It’s evident that you and Gabe are still very much in love, your home is lovely, and you run 2 businesses. You’re one of my mommy heroes for sure! I look up to you in many many ways. I work at the design office while my son’s at school. When we get home, I try to use those few hours to work on my jewelry since that’s about the only time I have to work on it. If we have to go to the store, then nothing gets done. Lol- you know Atlanta traffic…I try to get any errands done before traffic goes crazy! Then I like to have dinner ready for when my Gabe gets home. After clean up, showers, etc…I’m too tired to get much of anything else done. As your kids get older, they will be a great help with chores around the house. My son has taken on a good chunk of the afternoon chores, which is fabulous. But, he’s also at such a precious age just before that tween stage. He’s my best buddy & wants to chat my ear off over every little thing. He is a major momma’s boy & doesn’t like letting me have personal time (sometimes, I like to take my long, sweet time in the shower just for the peace and quiet)! Soon, he’s not going to want anything to do with me..so I try to give him my attention as much as possible for now! My mom is one of them. i really needed to see this today! i am due next month with my first and i’m already having some anxiety about having/not having a schedule. this reminded me that it IS okay to skip laundry and vacuuming sometimes…as long as i have a happy family that is taken care of and knows i love them 🙂 thank you so much for this! you are such an inspiration and a wonderful mother! Such an awesome post..I think I am equally busy but with many variations. I have only one kid who is 2 yr old and don’t sleep till 11 pm and a day job + daily commute that takes around 13 hrs altogether with exercise, cooking, cleaning and sleep managed along with my blogging occupying their own timelines in a day. Coming to time management, I must say not being too hard on yourself and keeping aside some ME time and loads of good music will help a lot. Good luck for your Brand Market too dear. You are the perfect combination of Audrey Hepburn and Edith Stein. Both would be very proud. So beautiful, Anna! That balancing act is so hard to come by, but this magical phase when all three nap (mine do too!) helps me gear up for round two! Sometimes in the middle of a bedtime, I imagine all the families who are striving for the same peace and harmony amidst the chaos and smile because there is a sense of solidarity there, I’ll say a prayer for you next time 🙂 Thanks, again, for sharing!! Thank you for this post! Im writing now when my 11month old baby finally got to sleep. It really provided me some power:) as working from home, for wall decals and invitation designs, even with 1 kid could be difficult but seeing your schedule i feel a releif. And see that it is still ppssible to have a working life with 1+…kidos! I pray that your family will always have peace and love; and us – readers to have many more posts from you! Tag team for sure! I couldnt imagine getting anything done with my husband support. Thanks so much for posting this Anna! You have such a beautiful perspective on motherhood and the balancing act that is life. It was so fun to read this little peek into your daily life! Thanks again for sharing! Too bad you do not live in Brazil. Here hiring help is considered a necessity for a working woman. It is a cultural thing. It works nicely for everyone. Now that my kids are grown, I don’t have full time help, but a cleaning person, whom I consider a friend that cleans my house in exchange for $. That means that for a 5 day week (in different houses) she makes twice as much as a salesperson who works 6 days a week. You more than deserve a babysitter. Your creative work is wonderful. I wish you all the best. i’ve always been so curious how full-time bloggers and mamas plan their day! all of the potential, structure less freedom sounds tempting..i’d probably be SO off task all day. i applaud your discipline and commitment! this is awesome. also- yes yes to getting dressed for the day. gets you in the zone! Your post was inspiring and also amazing. I only have one baby and working from home is so HARD even at part time. I’m usually so exhausted by the time he goes down for a nap my brain is mussy! Sounds like you have a good plan and a lot of drive! This post was so refreshing. Often times we feel guilty when one part of our world rules the other (ie work, career, aspirations, being a good mom, role model and wife). I really enjoyed seeing a day in your life. Thanks for sharing! I’ve just found your blog, Anna, through your Blog Society Q&A! I love this post. It’s a juggle I’m really struggling with but I feel so calm and inspired after reading your words. I love how you measure success by the tone of your household! Writing that one down! 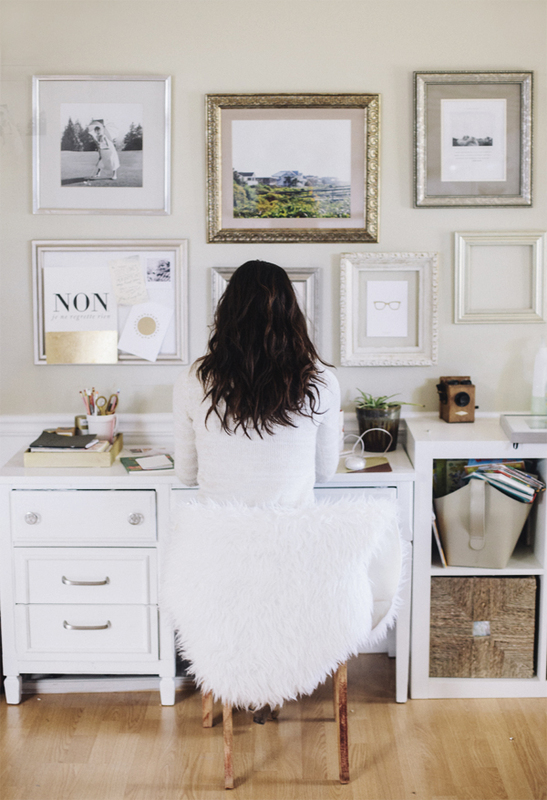 Just found your blog while searching for home office inspiration on Pinterest and absolutely love the post! So re-assuring that there are other mothers out there that have stopped chasing the elusive work/life balance! I appreciate that Tiffany, thank you so much! Cheers! You are so inspirational and amazing! I have trouble juggling with even two. Thanks for the motivation to use my time more wisely. No excuses! I loved this post! I’ve been struggling with managing my time and this for sure has uplifted me. Thank you. It’s funny that I’ll be transitioning within a few months from a WOHM (and a single one at that) to a married (WFHM) with a toddler, a 19 year old step-daughter, dog, cat and other older stepchildren who visit frequently. I thought my day was long now! geez – keep up the hard and good work and yes, the supermom myth is just that, a myth! well thanks for taking the time to read! An impressive share! I’ve just forwarded this onto a co-worker who was conducting a little homework on this. And he in fact ordered me dinner because I found it for him… lol. So allow me to reword this…. Thanks for the meal!! But yeah, thanx for spending the time to discuss this issue here on your web page. I love this post. I too have difficulty figuring out how to juggle mommyhood and working mom. Even at this minute I was googling schedules of other work from home moms and I stumbled onto your website. I love what you said about not wanting to chase a supermom title and the only mom you want to compare yourself to is your own mom. I have two children under 3 and thinking of having another one, all while trying to start a blog and an etsy shop. You have truly inspired me. Thank you. Thanks for the link! I respect your writing and how you balance your professional and non professional life.